A chance to get a glimpse of The Royal Opera's new production. 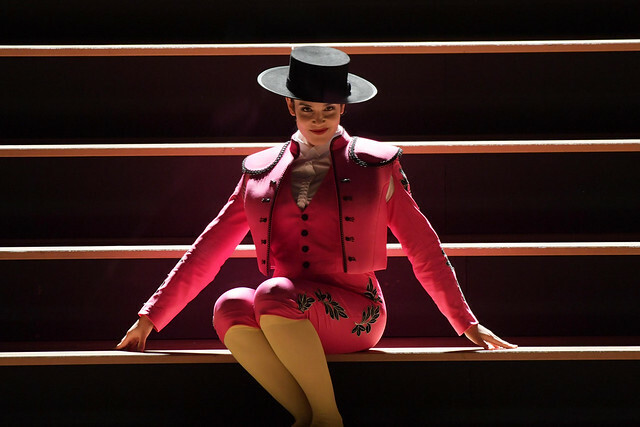 Audiences were recently offered a unique glimpse into The Royal Opera's new production of Carmen during an Insight event which is now available to watch on demand. Featuring members of the cast and the creative team, the event featured performance extracts of Bizet's well-known opera, as well as interviews with director Barrie Kosky, conductor Jakub Hrůša and star Anna Goryachova (Carmen). The event was presented by Flora Willson. Following his success last Season with The Nose, Kosky returns to Covent Garden with a highly physical production of Carmen which was originally created for Frankfurt Opera. His is a far-from-traditional take on the classic, incorporating music written by Bizet for the score but not usually heard, and giving a new voice to the opera’s endlessly fascinating central character. Carmen runs 6 February-16 March 2018. Tickets are still available. The production will be relayed live to cinemas around the world on 6 March 2018. Find your nearest cinema and sign up to our mailing list. And is staged with generous philanthropic support from Mrs Aline Foriel-Destezet, Yvonne and Bjarne Rieber, Alan Howard, Trifon and Despina Natsis, The ROH Young Philanthropists, and the Friends of Covent Garden. Looking to the coming events. Thanks for this. I recommended it and posted a link for the opera lovers in the Facebook group "Met Opera Live in HD." We hope to see more of Jakub Hrůša over here in the USA. He has guest conducted in New York, Baltimore, Chicago, Dallas and San Francisco. Also I was not th only one to walk out, others did so during the performance...something I am too polite to do ! Aaah, so here was the morning that, sadly, I missed. Because I did go and suffered this production yesterday and I still suffer and regret going. If they gave me a Delorean would I use it to unsay something to a former love interest? To pass an exam with an A grade? To win the lottery?...No...I would go to the day I went to buy the ticket and stopped myself of doing so. Loved it. Start to finish. Nice, different interpretation. Very rude to walk out in my opinion, it can't be THAT offensive, it's just a show! It's not a 'show'! It's an opera. It was appalling. I agree that reinterpretation can be valuable, but NOT in this case. This was a travesty. What has pantomime to do with Carmen? I am increasingly annoyed that directors can get away with such tripe. And a set consisting of one staircase for the whole opera! Lazy. I closed my eyes in parts and the music was exquisite. Her 'shrug' at the end was fatuous. What I saw was both annoying and disrespectful to Bizet. Just so weird opera ever. Main role, Carmen was the worst. Well I was there in the front row of the Orchestra Stalls last night and.... I loved it! Anna Goryachova was sublime, her voice weaponised in a mocking, diatribe against the requisite component parts of a woman that men identify as beautiful. The final act is a triumph - the twist at the very end will devide opinion, I loved it immediately, pondered upon it afterwards and hated it, slept on it and awoke loving it again. I saw this on a live link at a cinema. AG was the best Carmen I've ever seen, and I warmed to the production in the last act, but I largely agree with previous luke-warm comments about the bonkers nature of the production. I don't think Carmen should always be in a red frock with a rose between her teeth, but this went too far (Carmen in a gorilla suit? Why?). The dancers were fabulous and added to the spectacle of the piece - so far so good. The movement and life in the chorus was innovative, more on the plus side, but I hated the set. The steps were so many and so steep that only the youngest, slimmest and most lithe of the performers could mount to the top without slowing and labouring half way up looking like carthorses with backsides sticking out to the audience and hands practically on knees (and, as this is opera, the cast is never youthful!) and as for doing a Fred Astaire on the way down.... not likely. AG however was so incandescent that I forgave it all would watch it again. Worth a cinema ticket, not sure I'd feel the same if I'd paid live theatre prices. PS The stairs were noisy and the cast clumping up and down them overpowered the music in the first act. Then I sort of got used to it. I am still allucinating from what I saw tonight...I am an inconditional of Carmen and try to see any production of it. So, despite my doubts after seeing a few pics, I dared to go to the cinema.but still a bit scared of what could happen with this kind of "surealistic" production. It was surprise after surprise...a staircase as only scenary, Zuñiga as a gay character moving his body ridiculously, Carmen dressed in a KingKong "costume to sing the havanera.....OMG!!!! Anyway, I got a new experience for 19euros and enjoyed mBizet again. I do not understand the negatives! I don't have enough superlatives to express how much I LOVED this production. Anna Goryachova was spell binding as Carmen and what a voice. Please try to watch and indulge in something that's different to the norm. My fourth Carmen, and the most memorable to date. Anna was everything you could wish for in a Carmen, I fell in love with her. Don Jose was out of his depth and the rest of the cast made him look average. Where did does dancers come from absolutely awesome. No one seemed to notice the audio was not as good as it should have been, hence the muffled diction on occassions. Overall I have to say a great night at the opera. I was spellbound throughout on the 23rd of February and expect again to be on 16th March when I return for another performance.